This blog has been following the situation of the unjustly imprisoned Baha’is in Iran for the past year. 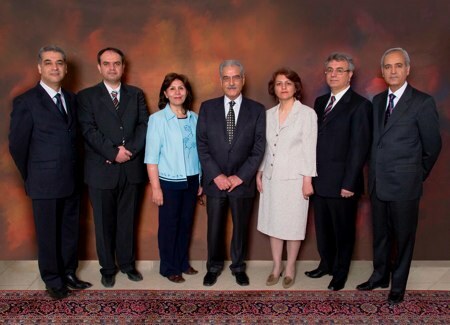 Latest news from Iranian government is that the trial of the 7 Baha’i leaders will be on Monday, April 12th, 2010. The Iranian government has postponed the trial date so many times, it’s hard to say that if there will be any trial come Monday. In any event, these Baha’is remain imprisoned under no good reason, other than being a Baha’i. The seven imprisoned Baha’i leaders, sometimes called the Yaran, are: Mrs. Fariba Kamalabadi, Mr. Jamaloddin Khanjani, Mr. Afif Naeimi, Mr. Saeid Rezaie, Mrs. Mahvash Sabet, Mr. Behrouz Tavakkoli, and Mr. Vahid Tizfahm. To remember the Baha’i 7, we’re posting below the video of the event to support the Baha’is held last August 12th, 2009 at the Western Justice Center. Over 150 were in attendance. It is in 8 parts, with a musical performance at the end. 9th Court of Appeals Judge Dorothy Nelson opens this special program to raise awareness of the plight of the Baha’is in Iran on August 12, 2009 at the Western Justice Center in Pasadena, California. Over 150 concerned citizens in attendance. As of April 7th, 2010, the 7 Baha’i friends (5 men, 2 women) mentioned in this series of videos have still not been released by the Iranian government, despite international pleas. Standing up for the Baha’is are US Congressman Adam Schiff, Pasadena Mayor Bill Bogaard, and Fire Chief (now in the Obama administration) Bernard Melekian. Sylvian Castel de Oro reads the opening prayer at the end. Brief YouTube movie gives an overview of the situation of the Bahai’s in Iran. Pasadena Mayor Bill Bogaard speaks afterwards. Judge Dorothy Nelson introduces Congressman Adam Schiff, of California’s 29th district, overseeing Pasadena. Congressman Schiff speaks knowledgeably about the situation in Iran. Congressman Adam Schiff talks about the situation of the Baha’is in Iran and Iran in general. US Congress House Resolution 175 has passed condemning the Iranian government false imprisonment of the Baha’i leaders in Iran. Congressman Schiff also discusses Iran’s recent election, nuclear proliferation, and more. Police Chief Bernard Melekian (now in the Obama administration) speaks about his support for the Baha’is. Judge Dorothy Nelson invites audience to ask questions. Congressman Adam Schiff is recipient of all questions. Congressman Adam Schiff answers more questions from the public about the repression of the Baha’is in Iran and other questions. Iraj Kamalabadi, brother of falsely imprisoned Baha’i in Iran, Fariba Kamalabadi, speaks up on behalf of the Baha’is at the Western Justice Center in Pasadena, California. 9th Court of Appeals Senior Judge Dorothy Nelson concludes the program. Grammy nominated musical artist Tierney Sutton and Jamie Findlay perform “Skylark” at the conclusion of an event to support the Baha’is of Iran. Held at the Western Justice Center in Pasadena, California. 9th Court of Appeals Senior Judge Dorothy Nelson offers final remarks. Event Participants: Senior Circuit Judge Dorothy W. Nelson of the United States Court of Appeals for the Ninth Circuit, US Congressman Adam Schiff representing California’s 29th District, Pasadena Mayor Bill Bogaard, Pasadena Fire Chief Bernard Melikian (now appointed to a position in the US Department of Justice in the Obama administration), brother of one of the Baha’i’s in Iran — Iraj Kamalabadi, Grammy nominated jazz artist Tierney Sutton, guitarist Jamie Findlay, and Local Spiritual Assembly member and Faculty member at Cal Poly Pomona, Sylvian Castel de Oro. Many other officials, religious groups, and non-profit organizations were present, including District 7 Pasadena Councilmember Terry Tornek, former Executive Director of the Western Justice Center — Najeeba Syeed-Miller, Assistant Director of Interreligious & Intergroup Relations for the American Jewish Committee Randy Brown, Catholic Diocese of Los Angeles, IDF Executive Director and Pasadena community activist Dorothea Bradley, and more. The Pasadena Baha’i Community is sponsoring a prayer gathering on Monday, January 11th at 7:30pm to pray for the release of the seven Baha’i prisoners facing trial in Iran. Location will be at a private home: 3330 San Pasqual, Pasadena, 91107. For more info please contact John 626-298-1603. The trial of the seven leaders of the Baha’i Faith in Iran is currently scheduled for Tuesday, January 12th in Tehran. To summarize, these individuals have been held in the notorious Evin prison in Tehran for well over a year without access to their lawyer, Nobel Laureate Shirin Ebadi. The Iranian government’s charges against them are trumped up: “espionage for Israel, insulting religious sanctities, and propaganda against the Islamic republic” and “spreading corruption thoughout the earth.” This is patently ridiculous and part of the insiduous pattern of persecution that have followed the Bahai’s in Iran since the Faith’s inception in the 19th century. We have been very fortunate to be supported by our national government, but also our two Calfornia Senators, Dianne Feinstein and Barbara Boxer who supported Senate Resolution 71 condemning this persecution, Congressman Adam Schiff who actively supported House Resolution 175 here in Pasadena along with Pasadena Mayor Bill Bogaard on August 12th, 2009. We also have been fortunate to have received support from the media, both national in Time Magazine, and local, in the Pasadena Star-News. We’re writing you because seven of our dearly loved Baha’i brothers and sisters in Iran are in grave danger, and possibly face execution. They have been held in Tehran’s Evin prison for over a year with no access to their lawyer, Nobel Laureate Shirin Ebadi. Their crime: being Baha’is. The US State Department, the UK Foreign Office Minister, Amnesty International and others have roundly condemned the imprisonment and trial of the Baha’is: http://iran.bahai.us. On February 13th, 2009, a bill was introduced in Congress, H. Res. 175, “Condemning the Government of Iran for its state-sponsored persecution of its Bahá’í minority and its continued violation of the International Covenants on Human Rights.” Our Congressman, Adam Schiff, supports it. S. Res. 71, a concurrent resolution to H. Res. 175 regarding the persecution of the Baha’is in Iran, was introduced into the U.S. Senate on March 9, 2009, receiving support from our Senators Barbara Boxer and Dianne Feinstein. The Baha’i Faith is a peaceful religion that seeks to promote the unity of mankind. Our principles are in alignment with American values: http://www.bahai.org. We may be small in number (about 6MM worldwide), but we are spread out across almost every country in the world and are trying to be of service to humanity. Baha’is have been in Pasadena since the early 20th century. Come meet us on Wednesday, August 12th at the Western Justice Center (55 S. Grand Ave., Pasadena 91105). Attending and/or speaking will be US Congressman Adam Schiff, Pasadena Mayor Bill Bogaard, Police Chief Bernard Melikian, and the Hon. Dorothy Nelson, 9th Circuit Court of Appeals. On the cover of the latest issue of Newsweek magazine, I was faced with a sullen Mahmoud Ahmadinejad and the provocative title, “Everything You Think You Know About Iran is Wrong.” Excited to think that I might discover something new about Iran in this issue, my excitement diminished after reading the same old story again: that the Iranian people are good but misunderstood; that the government is bad, but not as bad as you think, and no, it’s not a dictatoship. This might seem familiar if you followed this blogs’s reporting about Roger Cohen’s articles in the New York times earlier in the year. Newsweek should rename this article, ‘Everything You Think You Know About Iran is Incomplete.’ Especially given the fact that the most underreported large story in the West about Iran is the ongoing, unforgiving repression of the Baha’i community there. Journalist Roxana Saberi may have drawn a lot of attention when she was recently freed in Tehran’s notorious Evin prison after a 3 month stay, however some 30 Baha’is remain incarcerated there for over a year, under false pretenses, with no due process and no access to their lawyer, Nobel Laureate Shirin Ebadi. Currently the imprisoned 7 member Baha’i leadership in Iran may be facing the death penalty soon, for the crime of simply being Baha’i. Perhaps because these Baha’is were neither American nor journalists is one reason why the Western media avoided covering this story widely. However the facts behind why the Baha’is are being imprisoned are very important for Westerners to understand — the community’s mere presence in Iran (the largest religious minority, with over 300,000 members, much larger than the Christian and Jewish populations) can be perceived as a threat to the Iranian status quo. So what do Baha’is believe in that is so threatening to the Iranian leadership? –the Baha’i Faith believes in the unity of all the world’s major religions as one common faith from God, from Judaism and Hinduism up through Islam and beyond. –Baha’is reject any clergy and they participate in an elected, spiritual democracy that shuns any form of campaigning or electioneering. –Baha’is also believe in world peace, the equality of women and men, the harmony of science and religion, the independent investigation of truth, among some of the more famous principles. –To boot, Baha’is also are to remain obedient to their government, no matter how bad, how corrupt, and even if they throw them in prison. Nice guys seem to finish last. All of the above principles seemingly conflict with current designs of the Iranian government. And these principles are very appealing to a disillusioned Iranian public–which in turn has led to the severe crackdown on the practice of the Baha’i Faith in Iran. If you would have written a better reply, this blog would be grateful to hear about it! Today, May 14th, marks the one-year anniversary of the imprisonment of seven Baha’i leaders in Iran, who have spent a year in jail without formal charges or access to their lawyer, Shirin Ebadi. The families of the prisoners were recently informed that a new accusation has been lodged against them by the Iranian government, the charge of “spreading corruption on earth,” which carries the threat of death under Iran’s penal code. Ms. Dugal also noted that Iranian President Mahmoud Ahmadinejad has frequently emphasized the importance of “justice and human dignity” and “the establishment of a just world system,” such as when he addressed the UN Durban Review Conference in Geneva last month. “How can the calls of the Iranian leadership for justice in the international sphere be taken seriously if they do not grant justice to their own citizens? In Iran, by all accounts universally agreed upon human rights are routinely ignored, not only for Baha’is but also for women, journalists, and others who only seek dignity and justice,” she said. The seven are Mrs. Fariba Kamalabadi, Mr. Jamaloddin Khanjani, Mr. Afif Naeimi, Mr. Saeid Rezaie, Mrs. Mahvash Sabet, Mr. Behrouz Tavakkoli, and Mr. Vahid Tizfahm. All but one of the group were arrested on May 14, 2008 at their homes in Tehran. Mrs. Sabet was arrested on March 5, 2008 while in Mashhad. Read more about them. The prosecution of the leaders is just one step in a 30-year-long systematic campaign orchestrated by the government to eliminate the Baha’i community as a viable entity in Iran, the birthplace of the Baha’i Faith. The Baha’i Faith is the youngest of the world’s independent monotheistic religions and one of the fastest-growing, with a significant presence throughout the United States. Baha’is view the world’s major religions as part of a single, progressive process through which God reveals His will to humanity. Major Baha’i tenets include the oneness of humanity, equality of men and women, eradication of prejudice, harmony of science and religion, universal education and world peace.